Socialism in German, in 1922. The edition presented here is that published by Liberty Fund in 1981. It follows the text, with correction and enlargement of footnotes, of the Jonathan Cape, Ltd., edition published in London in 1969. The edition was based on the 1951 edition by Yale University Press which slightly enlarged the first English edition published by Jonathan Cape in 1936, translated from the German by J. Kahane. Only a few corrections of obvious typos were made for this website edition. One character substitution has been made: the ordinary character “C” has been substituted for the “checked C” in the name Cuhel. Socialism: An Economic and Sociological Analysis, translated by J. Kahane (London: Jonathan Cape, 1936). Planned Chaos (Irvington, New York: Foundation for Economic Education, 1947). This enlarged edition was reprinted by Jonathan Cape (London) in 1969, and is here reprinted again, in 1981, by Liberty Fund (Indianapolis). This edition leaves the text as translated by Kahane in 1936 and added to by Mises in 1951 undisturbed. The present publisher has, however, undertaken to add certain features to aid the contemporary reader. Translations have been provided for all non-English expressions left untranslated in the Jonathan Cape edition. These translations appear in parentheses after the expressions or passages in question. Chapters have been numbered consecutively throughout the book. All footnotes have been checked against the second German edition. When works in languages other than English are cited by Mises, information concerning versions in English has been provided when such versions could be located. The corresponding page references in the English versions are also provided insofar as location of these was possible. Complete information concerning the English version is provided at the first citation of a given work. Only the page references in the English are provided in later citations, but full information is easily located in the Index to Works Cited. All bibliographical information added to the footnotes is clearly labeled as a publisher’s note. Socialism contains a number of references to individuals and events with which many readers will not be familiar. 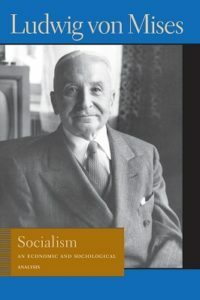 Brief explanations of such references are provided by asterisked footnotes printed below Mises’ notes and clearly labeled as being added by the publisher. Such notes also offer explanations quoted from Mises of his special use of a few English terms. Socialism. This index also provides English versions of works cited by Mises in German. In cases where no English version has been found, a literal translation of the title has been provided. A general Subject and Name Index is also provided. Socialism has been available in English for more than forty years and references to it abound in the scholarly literature. Since Liberty Fund editions are set in new type, the pagination of this new edition differs from the earlier ones. We have, therefore, indicated the pagination of the expanded edition of 1951 in the margins of the Liberty Fund edition. The pagination of all previous English language editions was the same from pages 15 through 521. In the enlarged edition of 1951, a Preface was added as pages 13-14, and the Epilogue was added as pages 522-592. By placing the pagination of the 1951 edition in the margins of our edition, we provide a guide to the location of citations of all earlier English editions. The publisher wishes to acknowledge with thanks the aid of several persons who helped with this edition. The many aids to study and understanding offered in this edition are due primarily to the work of Bettina Bien Greaves of the Foundation for Economic Education. She performed the monumental task of checking the footnotes against the second German edition. She also undertook the equally difficult task of providing most of the citations to English language versions of works cited in German. She provided most of the material for the asterisked explanations of unfamiliar references. She also did most of the work of preparing the new indexes. If this edition is more easily studied by contemporary readers, most of the credit should go to Mrs. Greaves. For aid with translations from Greek, the publisher acknowledges the help of Professors Perry E. Gresham and Burton Thurston of Bethany College. For help with Latin translations, Professor Gresham must be acknowledged again along with Father Laut of Wheeling College. Percy L. Greaves, Jr., of Dobbs Ferry, New York, provided translations from French. Professor H. D. Brueckner of Pomona College provided aid with locating translations and citations of Kant. French translation by M. de Hulster, Librairie de Médicis, Paris; Spanish translation by Pedro Elgoibar, Editorial Hermes, México. British edition by William Hodge & Company Limited, London; French translation by R. Florin and P. Barbier, Librairie de Médicis, Paris. British edition by William Hodge & Company Limited, London. “Edelsozialisten” means pure, or intellectual, socialists, “parlour socialists” of the world of culture, as one would say in colloquial English (Pub.). Collectivist Economic Planning (London: Routledge and Kegan, 1935), on pp. 87-130. This collection was reprinted in 1967 by Augustus M. Kelley Publishers of New Jersey (Pub.). Der Arbeitgeber, vol. 13, p. 35). Die Wirtschaftswissenschaft nach dem Kriege, Festgabe für Lujo Brentano zum 80. Geburtstag (Munich, 1925), vol. 1, pp. 149 ff. The Eisenach Congress of German Economists was called by Gustav Schmoller and some of his German Historical School colleagues. This Congress led to the founding of the Verein für Sozialpolitik (Society for Social Policy), which advocated government intervention in economic affairs. “Socialists of the chair” who were members of this organization had considerable influence on German policy (Pub.). pp. 459 ff. of this edition. Gesammelte Schriften [Berlin, 1877], vol. 1, p. 362.) Prince-Smith, however, would not have known how to discuss the socialist theories critically. Human Action: A Treatise on Economics, 3rd ed. (Chicago: Regnery, 1966), p. v. (Pub.). Britain’s Industrial Future, being the Report of the Liberal Industrial Inquiry (London, 1928). The Social Revolution, trans. J. B. Askew (London, 1907). Zur Psychologie des Sozialismus, new ed. [Jena, 1927], p. 17). Sozialpädagogik, 4th ed. (Leipzig, 1920), p. 201. Neue Sittenlehre (Jena, 1905), pp. 45, 62.